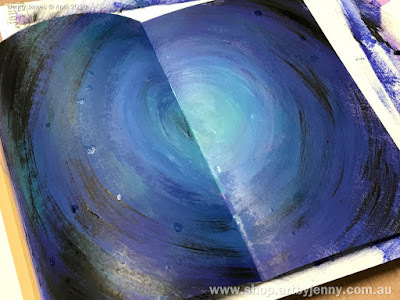 This painting was created inside a friend's book as part of the Australian Art Journal Swap group. 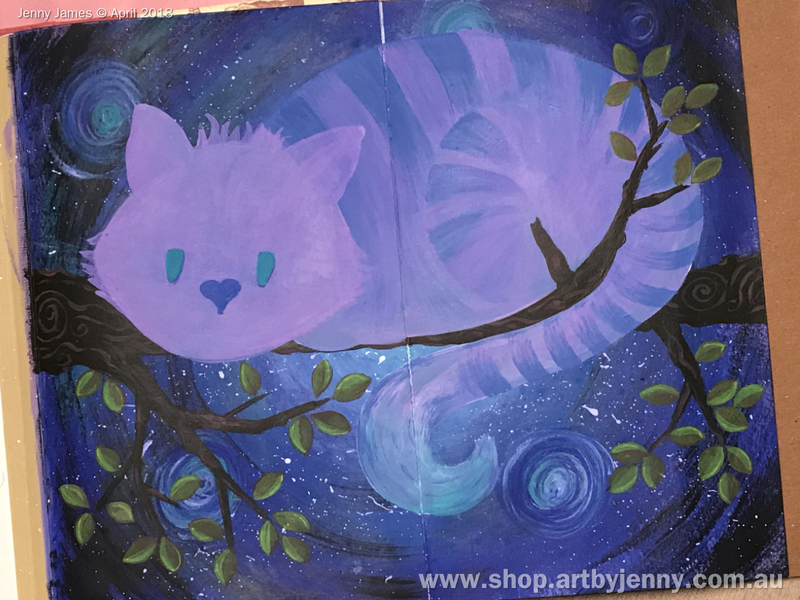 I've always loved everything about Alice in Wonderland, so painting something with this fabulous theme was absolutely awesome. I loved every moment, even when it wasn't going so well (I messed up the background and started again). I've so pleased with how my Cheshire Cat turned out that I'm grinning like he does! lol :) Hope you like him too! 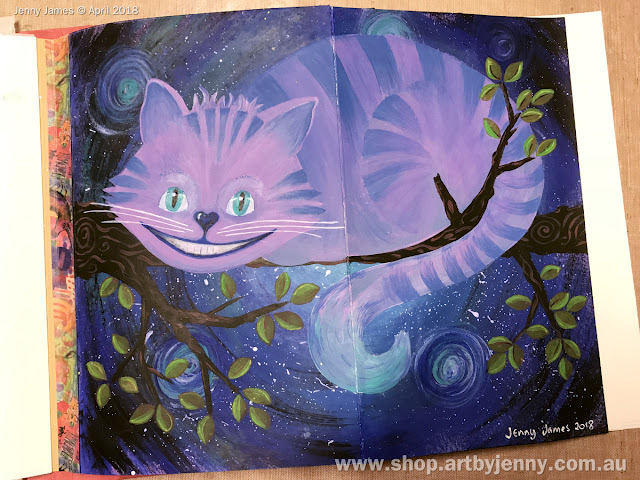 Above : the one, the only, the amazing Cheshire Cat! For a free template to print, colour or trace click the link - The Magical Cheshire Cat - FREE Template to Colour and Paint :) Have fun! 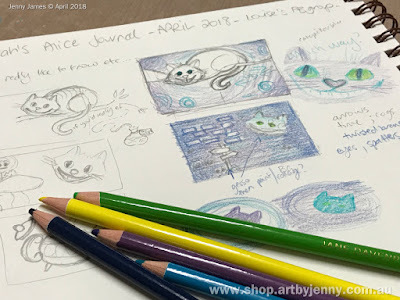 Scribbling out thoughts, deciding upon design, characters and choosing colours. So many fantastic characters from these books that are fun to portray in art! 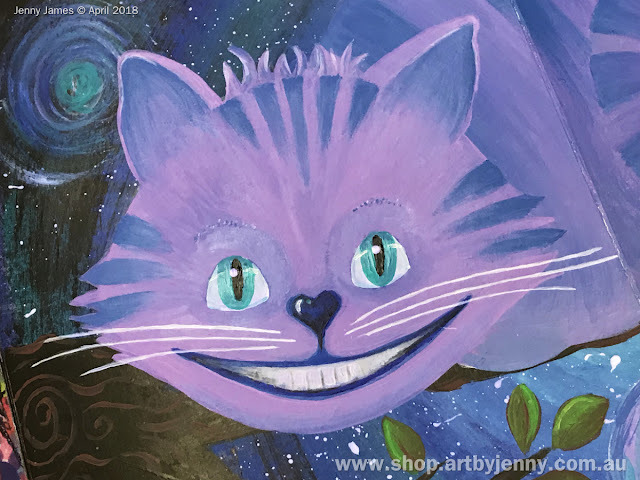 The final design is based upon the original sketch of the Cheshire Cat by John Tenneil when he (CC) was telling Alice the best way to go. I remembered after I posted the book so its a journal page without a written message. All is not lost, after 150 years of Alice, I think most of us know a few favourite quotes from the Cheshire Cat so quite possibly think of them whenever the cat is around. 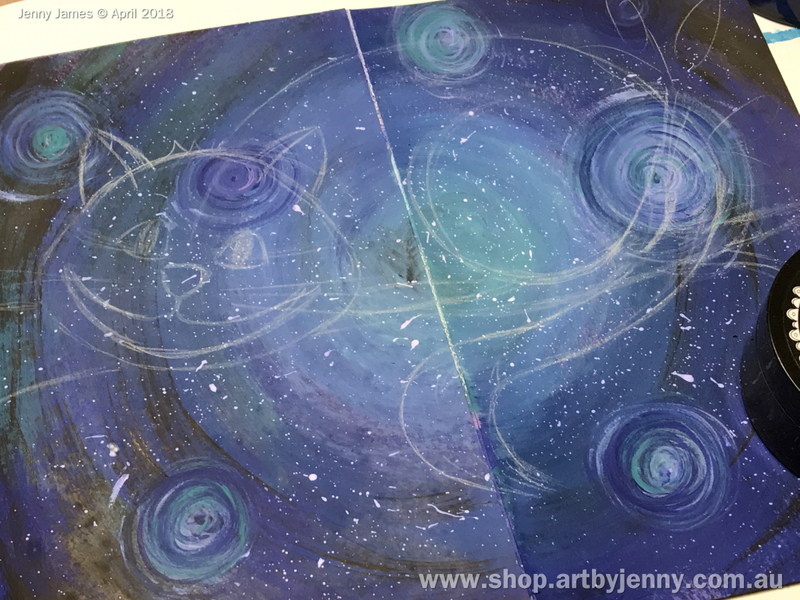 Round and round and round I went with the paintbrush ... layers of purple, dark blue then turquoise, more dark blue and lightly with the black. 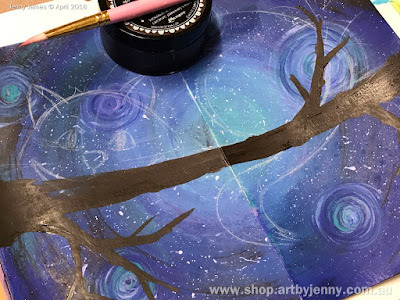 I then added white splatters using a Tim Holtz Splatter Brush... dip in the paint and flick towards the page. Creates much less mess than using an old toothbrush! The spirals are made up of the same colours, swirling around and around with a small round brush until they looked like mini abstract galaxies. Tip... Wait until the background is completely dry before drawing in watercolour pencil. 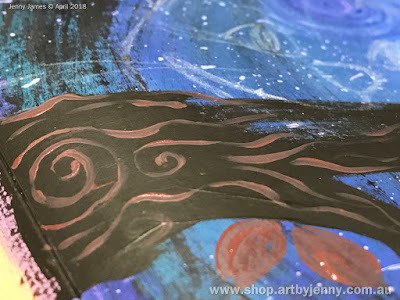 Dylusions Acrylic Paint is permanent once dry, so if you make a mistake, it can be wiped off easily with water (damp cloth) - without ruining your beautiful background. Freestyle with a flat brush using Ground Coffee and embellished with Melted Chocolate swirls... sounds delicious! Coffee and chocolate always go great together! Quite a nice combo, the two browns. Pre-mixed colours make painting much easier. Not only does it use less paint but it means you don't have to worry about needing to match the colour if you want to use the same colour another day. The leaves were painted in layers, one colour at a time. 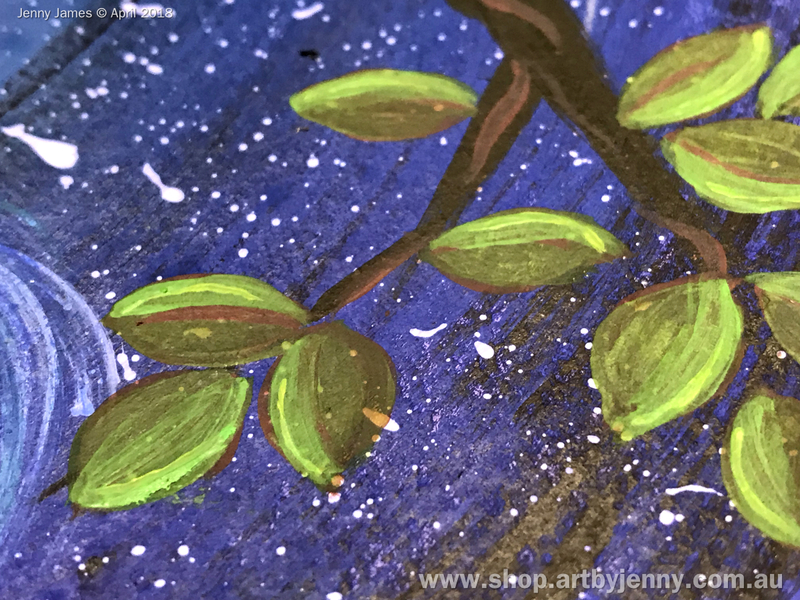 First I painted all the leaves with Melted Chocolate, then half of each leaf with Dirty Martini (yummy earthy green, my fave). Dylusions paint allows the colours underneath show through which helps add depth and extra dimension. Next I added a line of Lemon Zest (yellow) along one side of each leaf then waited for them to dry before painting over the same side of the leaf with Cut Grass (bright green). To finish the leaves off, I added a line down the centre with brown. 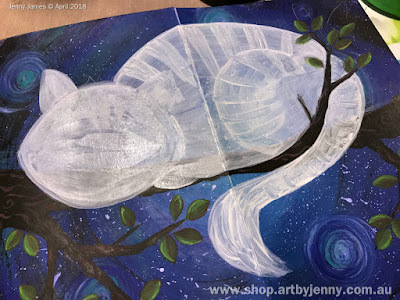 I painted his basic shape in Jane Davenport's smooth and creamy white gesso. I painted his stripes and features a few times to get the shape and stripes looking how I wanted. 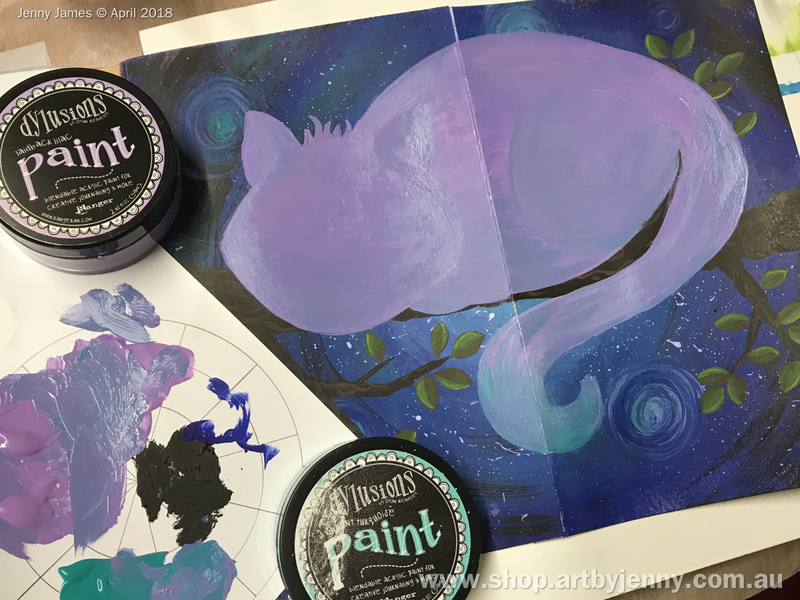 Once the white shape was ingrained into my head (don't ask), I put some Laidback Lilac and Vibrant Turquoise on the palette paper and mixed part of each to get a blue-purple mixture. The darker splosh is from adding dark brown (but I didn't use it). I painted the whole cat in the purple and blue, then where the colours met, blended it with the blue-purple mixture. The colour combination makes it look mystical and magical, almost glowing :) Pretty cool hey! I swapped between a flat brush and round brush back and forth to paint the stripes and details. A splash of white, dash of black, smoosh of turquoise and he's a completed cat. Wasn't quite as fast as all that but once his stripes were brushed into place, the face came together wonderfully. I used the dark blue and black for his nose and mouth, white with a hint of black and purple (tiny hint) for the teeth and eyes. Made the whiskers and highlights appear even brighter! Finally, to tidy up the left hand side edge, I added a strip of Jane Davenport Washi Tape.